Considering that I already spent 34% of my Vietnam travel fund on entertainment, it's no surprise that I chose option#2 to cross the border. So, do you want to know what happens inside a bus for 30 hours straight? 4:00 pm - Took shower at the hostel. This will be my last one for the next 30 hours! 5:00 pm - Motorbike pick-up from hostel to a random travel agency. 5:30 pm - Minivan pick-up from random travel agency to a roadside in the middle of nowhere. Things are starting to not look good. 6:00 pm - Pick-up by a random guy (who may or may not work for the agency). Walked 300 meters to the bus stop. 6:15 pm - Finally got on the sleeper bus; our home for the next 30 hours. All Vietnamese locals on board, all their eyes were on me. I was one of the 2 girls in that bus. Things defintely didn't look good. 6:30 pm - Surprise! There was NO toilet inside the bus that we will be stuck in for 30 freakin' hours. Ran to the nearest toilet, not sure if this was going to be my first and last on this trip. 7:00 pm - And we're off! It's the start of an epic journey. 8:00 pm - The driver turned off the lights just as Sarah was explaining the Indian road hierarchy system (where humans are the bottom and cows reign supreme) in the book I was currently fueling my wanderlust with: Holy Cow, An Indian Adventure. 10:00 pm - Toilet break, at last! However since most passengers were male, the driver didn't think it would be necessary to stop at a place where there were actually toilets. I had to do it in the bushes, behind a nearby building. Ran back as fast as I could for fear that the bus would leave without me. Our sleeping quarters: semi-reclining seats which were surprisingly cozy. 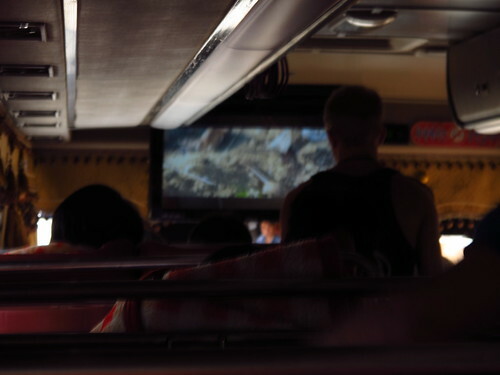 12:15 am - A skinny Vietnamese guy, who we shall henceforth call Chou, gets on our bus. He chooses to sit across the aisle from me, which was right beside Dan, another backpacker from Englad. 12:30 am - I wake up, startled by a loud noise. It was Chou, he was on his mobile and he was talking to someone and laughing loudly. Everyone in the bus was asleep at this point (so was I up until then). Who he's calling in the middle of the night, we would never know. 1:00 am - After 30 minutes, Chou finally puts the phone now. Dan, JV, Scott, Haj and I (the only foreigners on the bus) heave an audible sigh of relief. 1:05 am - Our sighs are cut short by the sound of Vietnamese pop playing...from Chou's mobile phone. Of course, he was considerate enough to play it on full volume so that all the passengers would hear. 1:30 am - Chou feels hot and icky so he does the next logical thing - He makes himself comfortable by taking off his shirt. Poor Dan had to sleep beside him the whole night. 2:00 am - Now there's only one thing that can make his night perfect before going to sleep - a cigarette. 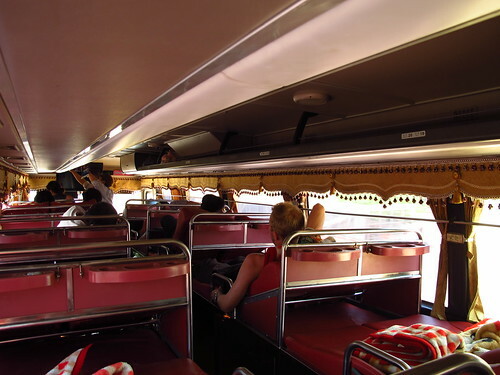 Will you let a little thing like being in an airconditioned bus with 20 other passengers stop you from doing this? Not if you're Chou! So, he lights up his middleton black and mild cigars and puffs away contentedly. For the 5 of us, dreamland seems so far away. 2:30 am - Everything is quiet now. Even Chou sleeps. 4:00 am - Dan gets spooned by his seatmate. He gently pushes Chou away from him. 5:00 am - Dan gets spooned again. This time, he forcefully shoves him back. Chou doesn't wake up and continues to sleep. Sometime between 6:00 and 7:00 am - Somehow, in some way, our prayers were answered. Our buddy, Chou, gets off the bus quietly and without any fuss. Good riddance, my friend. 7:30 am - Arrive at Vietnam border. Immigration office isn't open until 8:00 am. 8:00 am - Office is still closed, not a soul in sight. 8:30 am - Visa-on-arrival officer arrives looking like he had a rough night. 9:00 am - Everyone's passports are stamped to officially declare that we have left Vietnam. 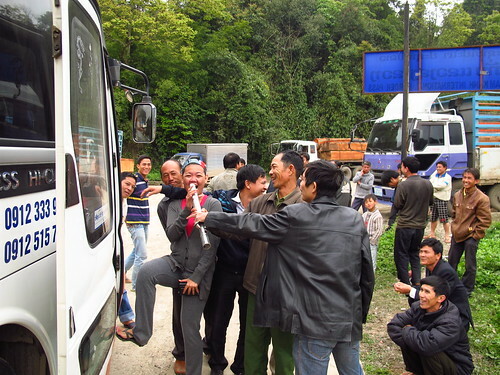 9:30 am - Walked 500 meters to the Laos border, got my passport stamped and paid nothing. It's times like these that I'm thankful that I'm Asian! 10:00 am - The locals finally warm up to the foreigners on board. Someone tried to steal a kiss! 10:30 am - Dan, JV and Scott finally got their Laos visas, after waiting an hour and paying 35 USD. 11:00 am - And we're now driving inside Laos! 1:00 pm - Lunch at a roadside stall where I had the worst chicken curry ever. Blech! 3:00 pm - JV asks the driver if we can play a movie. He grudginly agreed only after we promised that the movie would have blood, gore and car crashes. 3:15 to 4:47 pm - Jason Statham moves goods (humans or otherwise) without asking any questions. Business is good until he breaks the rules becase of a woman. Blood, gore and car crashes follow soon after, which made all the locals happy. 9:00 pm - Touchdown Luang Prabang. 10:00 pm - First order of business after checking in at Spicy Laos hostel? A hot shower. Sometimes I think long bus rides were meant for travellers to appreciate the miracle of a hot shower. You can book your bus tickets to Luang Prabang from many travel agencies around Hanoi's backpacker district along Ma May Street. Just make sure to scout around first to find the cheapest one. 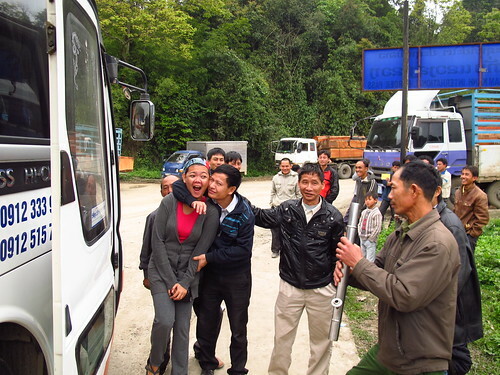 My Vietnam to Laos journey was long, action-filled, hilarious and only mildly uncomfortable. Some people I've met on the road have actually warned me that taking the bus into Laos from Vietnam was a death wish come true. I found this to be untrue but my Sole Sister Lois will tell you a different story. Watch out for that! That's what we all thought too! Pero at that time, he wasn't that funny! You're right Jonna! The bus and I, along with all the passengers, had a relationship. I especially bonded with the 4 other backpackers that were on the bus with me. What, no spooning for you Ed? You're missing out on the best part! and i thought our 8hour KTM Ride to KL was worst already! After this one, I can now sleep through almost any other bus ride! That's way too long of a bus ride to have no bathroom on the bus. And I thought it was bad when I had to endure a seven hour bus ride with one awful bathroom on board in Costa Rica. And I can't believe that other traveler was so inconsiderate. It's really amazing that people will be that loud when everyone around them is obviously trying to sleep. - you say that any hostels in Hanoi provide this advertising about "going to LP from Hanoi". Can you tell me in which hostel you were and which bus company ?- is it a weekly or daily bus ? as I only stay 2 days in Hanoi, I wouldn't like to miss the right day to leave for LP. As I will be in a 3-week road trip, I won't have time to figure out these kind of details. Whoops...the above fares should be DONG and not KIP. So that's 850,000 Dong for the Hanoi to LP journey! sorry. Sounds fun! I had a similar character to Chou on an overnight train from Hanoi to Da nang. I'm going to attempt this bus journey in a couple of months,on my own. Hope I'm not the only westerner/female on the bus!!! @Will, any travel agent in the old quarters in Hanoi will sell you this ticket, but just know that the actually price is 850,000 dong. . You could travel to the bus station and buy one yourself, but it's probably not worth it since you'll have to pay for someone to drive you there. Just bargain hard with the travel agent. Hi Chichi! May I know which period did you travel from Hanoi --> Luang? My friends and I are travelling around 25th June and we were wondering if there will be rains that will delay the bus trip. And how safe is the ride? 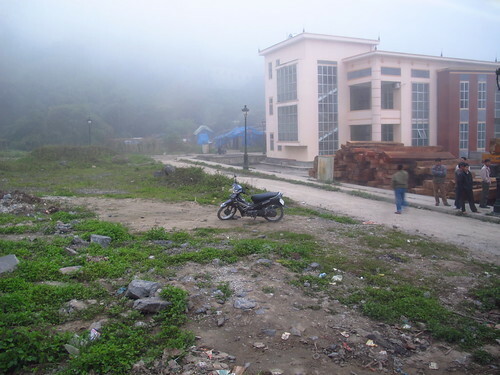 We are contemplating to travel to Vientian from Hanoi and then travel to Luang..however, it seems like a detour. Hi Ka~ Was there many transists in between? And which hostel did you stay in Hanoi? This blog sure is detailed. Me & my friend will have an 11-day stay in Vietnam and reading about this blog made me think of travelling to Laos in between those days. 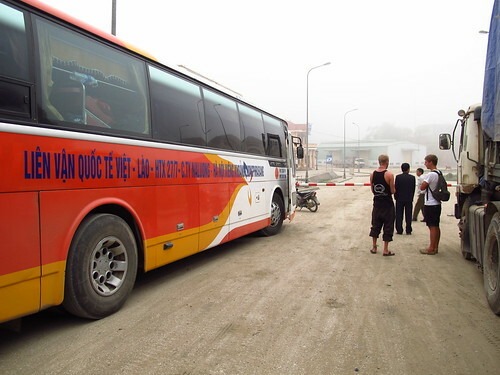 Aside from the plane and the bus, is there a TRAIN ride from Hanoi to Laos? Normally how much will it cost you to stay in Laos for a couple of days? and that's when i thought my 12 hour bus ride in turkey was crazy, more than double the time than my ride. Buti na lang i was so tired that nakatulog ako kaagad but i have to say bagpacking is one of the best thing one can do! I've been backpacking through eastern europe, turkey and will try to reach norway next month, but reading this blog makes me want to discover Asia!! Ang mga iba't ibang kwento ng mga tao at ang kanilang pinang galingan at patutunguhan just simply amazing. hi. thanks for your blog! very interesting. 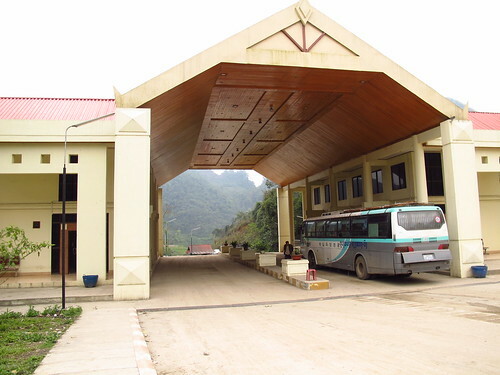 Im going to take a bus from Luang Prabang to Hanoi. As an Vietnamese, im still abit scared to take bus though i was on 32 hr train or 28 hours bus at last.. now i just need to be mentally prepared! Hey thanks for the info! I'm making the trip tomorrow evening! The joys of traveling.. Thanks for this post chichi and to all of the other readers who commented on their experiences - i think i just decided to fly from LP to Hanoi and skip the bus! I'm going to be doing this journey in a few days... not especially looking forward to it but it'll be an adventure, as SE Asian bus rides always are :) hilarious story though, thanks for sharing!